Snazzy writing about wonderful shows, including RSC’s new play, Dunsinane (a sequel to Macbeth). Here are some quick reviews of the shows I managed to see this weekend in London. This is all composed and posted via ipad, so expect some bloopers. I’ll polish things up later. Madcap! Some highlights: the play is set in what appears to be a Latin American colonial setting (imagine British soldiers at a 1980s Caribbean spa); Benedick first enters driving a golf cart stacked high with suitcases, sombreros, and British flags; Beatrice smokes, drinks, and passes out jaded commentary, the picture of a modern, emancipated woman (Donna much? ); Imogen is no longer silent and has taken over many of Antonio’s lines (who is missing from the play); the revels involve drag, including a Princess Leia and Tennant as Miss Piggy; the “window trick” is staged as a quick screw-against-the-wall during a strobe-lit bachelorette party; and Hero’s mock funeral is cunningly reinterpreted (below). Let me start with the obvious: this is a fantastic show largely because of Doctor Who. The chemistry between Tennant and Tate doesn’t need any time to build throughout the play: they carry it onstage with them. It is a product of their time together on Doctor Who, an interesting bit to add to the blend of a performance. Much of the Donna/Doctor relationship maps easily onto Beatrice/Benedick: the constant criticism of each other, the off-line verbal explanations (Tennant transforms every “why” into a wry question and Tate’s trademark laugh is here in abundance) and the sheer joy they each seem to experience from the exchange. 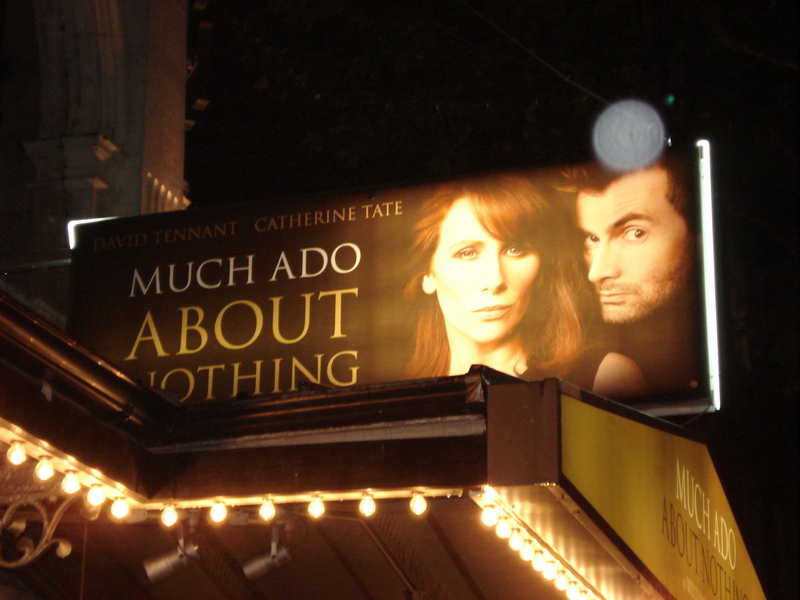 In a way, Much Ado lets Doctor Who fans see Donna and the Doctor finally get together. A brief amendment: Tate’s Beatrice is Donna in many ways, from her laugh to her attitude to her cocky grin. Tennant’s Benedick is not the Doctor, however: while the chemistry from the TV show blends well with the performance, Tennant is able to successfully leave behind the madcap antics of the Doctor (unlike, say, in his performance of Hamlet). Granted, Tennant knows his audience, and his audience knows him. Tennant lets Benedick’s prose breathe, feeling free to transform statements into questions, add expressive exclamations (most frequently “hmm” and “hah”), and taking his time with the humor. Both he and Tate know where every laugh in the show is, and their comic timing is quite flawless. When an audience is so primed to laugh, however, some things can go amiss. During Benedick’s 2.3 monologue (“this can be no trick…”), for instance, the audience broke out into hysterics early on. Tennant us off: his face and posture remained in character, while his hands silently signaled “wait for it!” The laughter died down, the monologue built to its climax, and the final, matter-of-fact “The world must be peopled” brought down the house. Similarly, a bit of unexpected laughter occurred in 4.1 during Benedick and Beatrice’s exchange after Claudio shames Hero. After declaring his love for her, Benedick exclaims, “Bid me do anything for you!” Donna breaks down in laughter: Benedick is clearly bad at this sort of hyperbolic wooing. She sits. She waits. She thinks. After a long pause (a good 10-15 seconds of silence) she looks up and says, “Kill Claudio.” The audience laughs. And no wonder: to this point in the play, everything that Tennant and Tate have said has been hilarious. They’ve played to that laughter throughout, egging it on. Here, however, they play the moment straight, not even waiting for the laughter to die down. By the time Beatrice is wishing that she could “eat” Claudio’s “heart in the marketplace,” the audience is silent: not a titter. So, while Tennant and Tate are quite capable of amping up the laughter, even in a metatheatrical way, they only ever do so in the service of the play. Shakespeare would approve. I mentioned above that Hero’s mock funeral is reinterpreted. Throughout the play, Claudio is a brash soldier, quick to love, quick to fight. He enters the wedding of 4.1 prepared to slander Hero, his jaw set, his impatience and anger clear. To my mind, this staging exacerbates the “problem” of Claudio: how can an audience accept that Hero forgives him in the final scene? Is he redeemable? This Claudio could easily be written off as a misogynist, a reading that pushes against the comic reconciliation. But the director had a trick up her sleeve. The characters assemble onstage for Hero’s funeral beneath a hauntingly harsh sculpture of the Holy Mother suspended from the ceiling. Claudio stands before a microphone. He mumbles his elegy into the mic in that tentative, exhausted voice of the grieved. Then the mourners exit. Claudio returns with a stereo and a bottle of whiskey. He presses play, and a hard rock rendition of the funeral song blares from the stage. Claudio quickly gets wasted, throwing back the whiskey like it’s sweet tea, and eventually pulls his pistol, setting it against his temple. An apparition of Hero appears to him, and he blacks out. Don Pedro appears to sober up Claudio for his wedding. Drastic? Certainly? Outside Shakespeare’s text? Perhaps. I think that Much Ado demands a repentant Claudio: by pushing Claudio so far toward callous violence, Rourke needed to do something drastic to recenter the character, something to show Claudio’s rage as self-destructive: attempted suicide goes a long way toward building audience sympathy. I should preface this micro-review by saying that I overslept before the show, discovered that the London Underground was closed near my hostel, and decided to walk rather than take a bus or cab. An hour and a half late, I arrived at the Globe and had perhaps the worst spot in the Pit: extreme stage left, my view blocked by one of the two large pillars. Thus, I was a poor spectator for this performance. I would also recommend that, if you ever plan on seeing two productions of the same play in two days, see the “better” show first. The Globe’s production was a fine performance, but their Beatrice and Benedick simply could not compete with the chemistry of Tennant and Tate, largely because they lacked the extra-textual force of the Doctor/Donna relationship. That said: the Globe’s production was, as usual for the Globe, historically conservative, including Elizabethan costuming, a subdued set design (some silk flowers, orange tree branches, and a few shallow pools of water onstage), and archetypal character work (Don Pedro is the authoritative Duke, Hero is the obedient daughter, Don John is the Machiavellian mastermind, etc.). The hallmark of this show, as is often true of Globe performances, is the audience interaction. Monologues and soliloquies were frequently directed to the audience: Beatrice singled out individuals to be the objects of her jokes or celebrations, hugging one young girl when she “overheard” Benedick’s love for her; during Benedick’s “I much wonder how one man” speech, one woman in the audience began laughing uncontrollably. Benedick played off of that laughter, waiting to continue the speech and encouraging the audience to share in her laughter. Even Dogberry got in on the metatheatrical fun, calling the entire audience the “men of the night’s watch” and selecting his watchmen from among the audience (preset actors). For me, however, the performance fell flat insofar as it resembled Tennant and Tate’s production. A few key moments seemed modeled on the Wyndham production. While it’s difficult to say which theatre used them first, for the purposes of this blogtastic review I’m giving Tennant and Tate the benefit of the doubt: their show opened first, was more heavily advertised, and charged higher ticket prices; more importantly, these moments work better in their show). For example: when Tennant first overhears Don Pedro, Leonato, and Claudio, he’s drinking a bloody mary from a long, curled straw. The Globe’s benedict also carries a fruity beverage with a straw (despite the anachronicity of plastic straws). When Don Pedro ask’s Tate’s Beatrice if she will marry him, Tate laughs uncontrollably, a “horsey” laugh that Tate used for Donna in Doctor Who. The Globe’s Beatrice reacts with the same laugh. Such cross-pollination is to be expected. But during the same run? The tough part about All’s Well (the problem of the problem play, as it were) is Bertram. To be polite, he’s not a very nice young man. What does Helena see in him? The rest of the play is straight-forward: Helena is a strikingly modern woman who uses all her resources to make her way in the world; Countess Rossillion is a loving and authoritarian woman, perhaps what Lady Macbeth might have become (if not for all that murder and guilt nonsense); Paroles, Lefew, and Lavatch are all stock comic characters (the Braggart, the Doddering Old courtier, and the Fool); and the King is the King. But Bertram is the hinge upon which this world turns (or the seam at which it unravels): male youth. There’s a lot of pressure upon Bertram to be the honourable son of an honourable father. As he understands it, honour means warfare, the path of Mars, not Venus. As Bertram, Sam Crane does a great job of internalizing that pressure, quite literally quaking (in fear? anger? anxiety?) when the King insists that he marry Helena. During Bertram and Helena’s goodbye kiss, Bertram is likewise split between desires: the kiss is more than perfunctory, and he stares after Helena long after she has left the stage. Left to its own devices, the main plot still risks faltering on the rocks of historical misunderstanding (what’s it like to come of age in the Renaissance?). Enter Paroles. I felt sorry for James Garnon’s character, perhaps because of his “expressive eyes” (as the woman to my left commented). While he is a hilarious figure of fun, he is also earnest: Paroles doesn’t wish to harm anyone (even Helena), merely to make his say in the world. To him, Bertram’s choice to run away to war is a necessary sacrifice. Honour doesn’t come from marriage, and society demands honour. Fortunately, Paroles and Bertram turn out to be mistaken. Less fortunately, the King remains in error, offering Diana her choice of husband at the play’s end. The system of honour that the King maintains is deeply flawed, forcing men such as Bertram to. Make impossible decisions. Today, honour is a defunct concept. 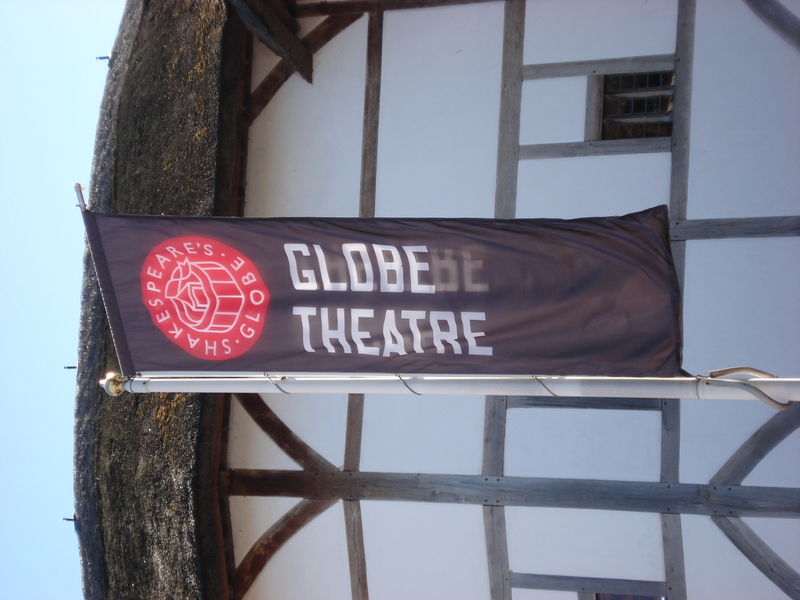 The Globe Theatre, with its insistence on historical preservation, does an admirable job of recovering that system of honour. Of all the Bertram’s I have seen, I hated this one the least. Christopher Marlowe might have become the greatest writer of blank verse, greater than Shakespeare, if he hadn’t gotten himself stabbed in head in a bar fight. Or for being a spy. Or both? As it is, Marlowe’s Doctor Faustus has some exquisite lines, and the vision of damnation is harrowing. The character development….not so much. The “A text” of Doctor Faustus was printed a few years after Marlowe’s death. The “B Text,” which the Globe used, was printed a good two decades after Marlowe’s bartime demise, and while the verse passages are largely the same, the comic verse scenes are expanded beyond belief (and perhaps, beyond relief). To perform the B Text, a theatre needs an engaging Faustus and Mephistopheles, but it also needs spectacle, spectacle, spectacle. Paul Hilton makes a superb Faustus, amping up the depraved delights of Faustus and his final horror of damnation (the counterpoint to his earlier, gleeful “Hell’s a fable!”). I was delightfully surprised to find that Arthur Davill (Rory from Doctor Who) is playing Mephistopheles: not exactly my idea of a devilish man, but he carries it off well. Davill presents a Mephistopheles who is all Machiavellian surface to Faustus: even when he admits that “This is hell, nor am I out of it,” he does so not as an admission of pain or weakness but as a sadistic gesture, grasping Faustus’ hand and sharing the torments of hell through some sort of revere empathy. When Faustus turns his back, however, Davill’s Mephistopheles really shines (or glowers): the raw desire Mephistopheles feels for Faustus’ soul is palpable, and I couldn’t help but root for this villain a bit. As for spectacle: Faustus’ good and bad angels are a bit disappointing. I’ve seen much better halloween costumes of angels, and the stylized katana fights between good and evil are a bit too anime-inspired for the Globe. However, the pageant of the seven deadly sins is exemplary: the sins rise up out of trap doors in the stage, acrobats alternately sinister and laughable; Greed perched upon a pillar and rolled across the stage; Gluttony stumbled across the stage in an enormous fat suit, spilling and dribbling food on the audience; Wrath took on the bodies of four demons, each wielding two rapiers like some Renaissance Kali; Lechery inspired an orgiastic frenzy in the other devils that filled the thrust stage. Needless to say, the Sins emphasized the Groundling experience at the Globe: Wrath is a bit more sinister when one has to nearly duck beneath his rapiers. A notable addition of the B Text: I’m used to Faustus’ final soliloquy in the A Text (printed in the Norton Anthology of British Lit). There, Faustus struggles to repent while continuing to cling to his magic, futilely conjuring the elements to protect him from the Devil. In the Globe production, Mehistopheles interrupts Faustus’ soliloquy to gloat: Faustus’ damnation is Mephistopheles’ victory. The devils emerge from a yawning, smoke filled portal, tiny puppets of tormented souls in their hands (half comic, half disturbing), trailed by a leather-decked, whip-wielding Beelzebub. The devils carry out Faustus lifting him high in their hands, and Mephistopheles beams with pleasure. The stage is empty, save an old Satan, who wears the stained armor of a good angel. Throughout the play he has leaned upon other devils, barely standing. Now he stands alone. Devils approach him, carrying a pair of massive white wings, which they unfold and hold up to his back. Satan earns the wings that Faustus aspired to. And then, in Globe Theatre style, the play ends in a dance filled with the puppets of the damned, megaphones projecting howls and chants, and a dueling lyres between Faustus and Mephistopheles. The Globe knows how to put the “spectacle” in spectacular. A ecocritical, animal-centric tale of the first World War that follows the life of a horse and weighs the suffering of man and beast, English, French, and German equally. When I read the plot synopsis I laughed a bit, astounded at the amount of overbearing political correctness such a plot must contain. Surely one can’t represent suffering across nationalist and speciesist divides without overburdening the play. And with puppets!!! I couldn’t have been more mistaken. 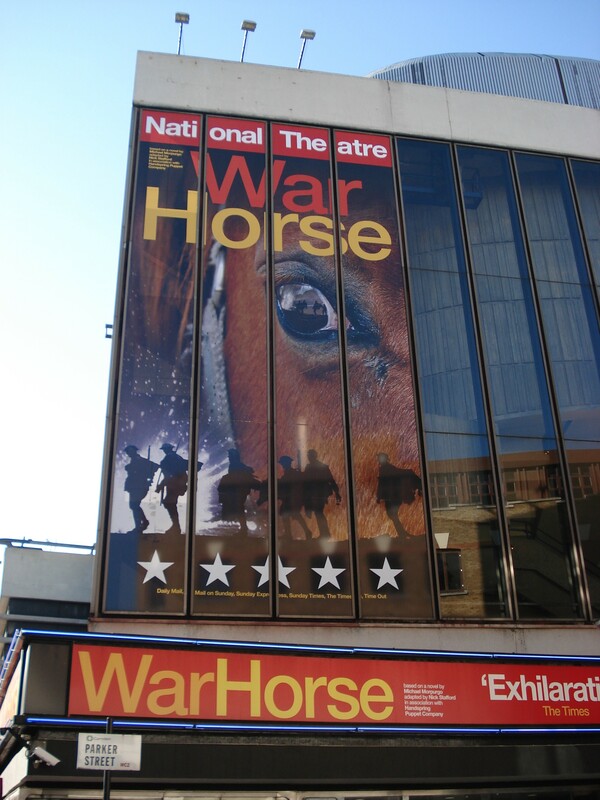 Warhorse is the single most moving piece of theatre I’ve seen all year, both emotionally and intellectually thrilling. The stylistic master note here is, of course, the puppetry. The two main horse protagonists in the piece, Joey and Topthorn, are each operated by three puppeteers. Although I feel that operate is the wrong term: played would be more accurate. One puppeteer for the front legs (heart), one for the back (hind), and one for the head (…head). The puppeteers are quite visible throughout the show, wearing simply period dress (1910s) that matches the color of their horse. In an early scene, Joey grows from a foal to an adult stallion: the foal is about as tall as the teenage boy Albert that cares for him, and all the puppeteers are visible beside the wood frame of the horse; when the stallion gallops onstage, the heart and hind puppeteers easily fit inside this warhorse whose shoulder stands as tall as any actor in the cast. Albert mounts Joey, and the subsequent victory lap around the stage (which on occasion revolves mid-stride) is sublime: a majestic animal made flesh out of wood, wire, and human creativity. When Joey neighs, his voice is not some synthetic recording: it is the combined voices of his three puppeteers. Just thinking of it gives me chills. I heard one spectator complain after the show that the puppeteers were a distraction: that was not my experience. True, I occasionally mistook the “head” for an actor holding the halter of a horse, but at was generally only in moments when the horses were idle or the action onstage was chaotic with lots of human actors running about. When the horses were the center of attention, the puppeteers became a piece of the animal, the ghost in the machine, as it were. When a horse dies onstage, its puppeteers slowly stand and back away, the soul of the animal leaving the body. Warhorse’s puppetry creates the terrifying as well as the sublime. The play stages several cavalry charges with Joey, Topthorn, and a few more static horses (with puppet riders). These charges embody so much of war: the majesty many wish to see in it; the dehumanization of war (while the horses feel fully embodied, the people-puppets seem less than human, intentionally so); and war’s ultimate futility. And while such a failed cavalry charge (against machine guns and trench warfare) is the climax of the first act, for me the climax of terror involves a tank. This puppet is merely the exposed skeleton of a tank frame that pivots on a central platform to imitate the shifting angles of the tank as it traverses the terrain of the battlefield. There are no visible guns. The tank is operated (the right word) by a half dozen or so puppeteers dressed in an anonymous black. They have become part of the machine. This is war. No guts or glory, only cogs. Fortunately, this play is also about a boy’s love for his horse, and a horse’s love for his boy, and it opposes the terrors of war with the victories of spirit: human and animal.